You are a seasoned NodeJS developer, and are looking to learn a new language, but you don’t want to go deep, just see how things compare with your current expertise, and then make a final decision. Chances are, you were initially a PHP developer, then you found your way into NodeJS and now you feel like you want to expand your expertise. Of course I might be wrong, but in this article we are going to look at some common patterns when working with NodeJS and how they compare in Go. We see that Go has only 25 keywords, and this can give you a clue on how simple it is to learn the language. We'll also be looking at the common language patterns, and we'll see how cleaner and easier it is to do some common tasks as compared to other languages. The standard library that comes with Go also has a lot of built in functionality, that you will find yourself rarely relying on other external libraries. Go code will not compile if you have unused variables or syntax errors. 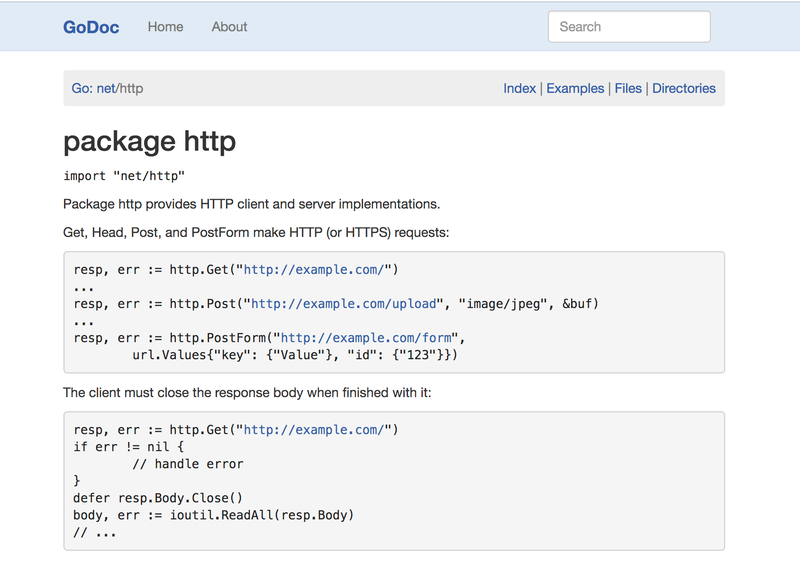 Here’s an example with the net/http package that we’ll use later. You can see examples are provided, and there are even tabs for the source code files. Sweet! We’ll look at a few language constructs that we are used to. Running this will produce Hello World in the terminal. This code can be run by typing in the following, or see it in GoPlay Space. where main.go is the name of the file. Go however, is statically typed, which means we have to define the types before hand, or assign them and let them be inferred. Here’s a comprehensive list of Go Types. var name string = "Scotch"
Assigning initial values in Go is done by with the var keyword, a variable name, and a type. Additionally and more commonly the := shorthand syntax can be used. When declaring variables with := , they are automatically assigned the correct type. The shorthand declaration syntax can only be used within a function. Finally, you can assign multiple values in one line like we have done in a, b := true, false. This will assign both a and b to the right hand values respectively. sentence := "Look, I'm not your Father"
Conditional statements include if else and switch statements. Here’s an example in NodeJS. You can run the app in GoPlay Space. You’ll notice the conditionals are a bit cleaner in Golang, with less brackets. Now that we know a little about the similarities and differences in language constructs, we can have a look at servers. Since we are coming from NodeJS it’s likely that we’re building a server, that returns JSON for instance. In NodeJS, chances are while writing a server, you are using Express as the base library for your server. It’s the most common, comes with a router and is the most battle tested. Here’s a NodeJS server. Here’s an equivalent Server in Go without any external library. Things are starting to get interesting now. Now, let’s introduce a router library, because, if we don’t, we’ll have a lot of this in our code. Then we are able to do this. I pulled this directly from Gorilla mux documentation. We see that the same way express accepts patterns, Gorilla mux allows us to use the same patterns. It can get a little complicated than what I’ve described, but I hope you get the idea. Gorilla mux also comes with helper functions that npm’s body parser helps us achieve. Go purist can however claim that these function can easily be written. Middleware are a great part of NodeJS servers. They are functions that sit somewhere, and are run before the actual request is run. In NodeJS, this is a simple snippet for a middleware that retrieves a secret from the env and uses it to authenticate a user. When reading variables from NodeJS, dotenv is commonly used. Go takes a similar approach. Since all a middleware does is take in a request do, something with it and decide whether the request should proceed. We’ve just written a function that takes in a [http.HandlerFunc](https://golang.org/pkg/net/http/#HandlerFunc) which is a function type, and the function structure is type HandlerFunc func(ResponseWriter, *Request), just like the Handler we wrote. The advantage is that the http.HandlerFunc type has a function ServeHTTP which takes in the response and the request pointer we passed, and executes the handle call. Some people call this approach wrapping functions, but this is the general idea. Again, you can easily write your own middlewares, but there are a couple of libraries out there to help you like http://www.gorillatoolkit.org/pkg/handlers and https://github.com/urfave/negroni. Most of the time, our servers usually depend on an external API to get some data it needs. Let’s say for example we are getting users from Github. This is the approach you would take in a NodeJS app. This piece of code can either be in your service, or anywhere you like. In Go, however, we do not need any external dependencies, and the net/http package can help us with this scenario. 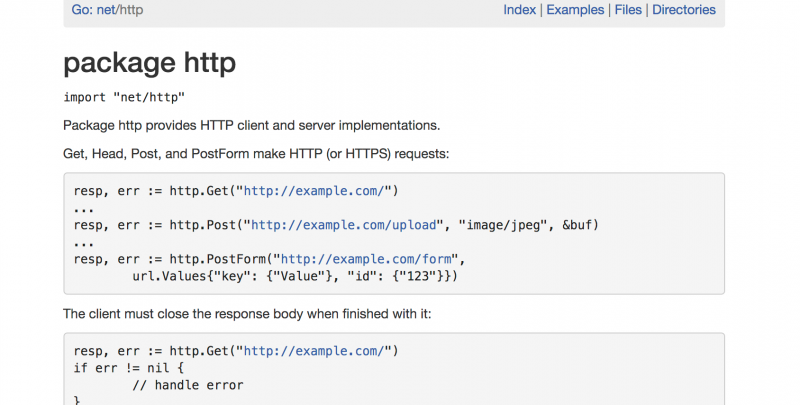 We use http.Get to make requests, and check errors. The response is usually in bytes, and we have to read it first, then convert it to string with strinb(bytes). You can add this to a main.go file and run go run main.go. This code can also easily be converted to a func, and called repeatedly when needed. NodeJS has various npm modules to help in database connections depending on the databases that you are using. These libraries most of the time come with their own methods, that try to make it easier for you to work with them, and some even offer ORM like features. Go however takes a different approach. The standard library provides an interface for working with databases called https://golang.org/pkg/database/sql/ which RDBMS package authors can use to implement drivers for various databases. Authors following the standard interface ensure greater interoperability for their packages. But to save you a lot of hustle, especially with SQL databases, https://github.com/jmoiron/sqlx will boost your productivity. Not to be left out of the ORM game either, the Go community has written many excellent ORMs such as https://github.com/jinzhu/gorm. Go’s files must be written within packages, and this usually affects your file structure. I hope you’ve gotten a gist of what it’s like to write Go, and you’d like to get into action. Golang is really praised for it’s concurrency and performance, and if you are building a large application, this would be a preferred choice. Here are some other cool stuff I did not cover, but are worth mentioning. I’ve been following this transitional journey for a while now, and would glady answer any questions you may have. Just leave a comment.